PC Games > Arcade & Action Games > Ride! Ride! is rated 3.5 out of 5 by 32. Rated 5 out of 5 by Purplepurple99 from Very Challenging! Some of the reviews for this game are, "It's too hard" or "It wasn't fun when you had to balance yourself". Well, the point is to make it as realistic as possible! I ride horses myself and keeping your horse aligned is very hard. The game was very interesting and had amazing graphics.The game creators did exactly that and the game is wonderful. So what if it is a bit challenging, that's what makes the game fun right??? I absolutely loved the DEMO and will buy the full game!!! Rated 5 out of 5 by DestinyNoel12 from This IS the BEST Horse game Avilable!A MUST Get! There isn't ANY tech issues for the Windows 7 & 8,Yes I've played on both ;# Fun Factor: It is AMAZINGLY fun, there are 3 Events, just as in real life.#Jumping Dressage & Cross Country.) Visual/Sound Quality: The Music is pleasant and the Visual is astonishing! The Horse ACTUALLY Moves like a Real horse O.O lol Level Of Challenge: The Game NEVER gets boring to me, sometimes a quit to cool off 'cause it gets Hard...but after a few times I get use to it, and so will YOU :D Storyline: There really isn't one except for the Competitions. My Overall Opinion: 5* Things that could be changed: I wish The Trainer Didn't Boast..it really gets annoying when you win your 1st competition, and every other time. Rated 5 out of 5 by hopperhorse from Awesome horse riding game! I have been wanting to buy this game since forever now. it takes a lot of skill that you even practice in actual horse riding. Rated 5 out of 5 by Kittylove15 from great game I got this game for my daughter, who is a big horse-lover. She plays this game all the time. It's got just the right amount of challenge and graphics are gorgeous. Rated 5 out of 5 by Delorya from A horse game worth buying I have played several horse games and most of em are boring, too easy and made for little girls. Ride! definately offers a good challenge for even older players who love horse games. There is no story line really, except for following your trainers instructions and trying to complete all the challenges he gives to you, perfectly. 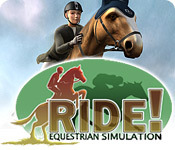 + hours of fun + the game saves itself automatically + great challenge, but not impossible + the show jumping has been executed perfectly + balancing your rider and horses stamina/nervousness + not too shabby graphics + a bit like equestriad 2001 + no brushing your horses little kid stuff + training your horse + doesn't require a lot from your computer - the background music is the same loop all over again - the dressage is a bit boring eventually and can frustrate a new player - no storyline, just riding like in equestriad 2001 So as you may see more pros than cons in comparison. Definately cheap and worth to buy game. Rated 5 out of 5 by SunsetMaiden1D from Ride! 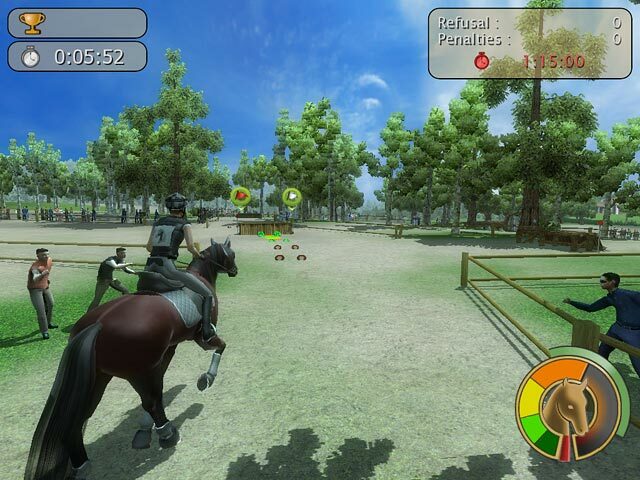 equestrian simulation. 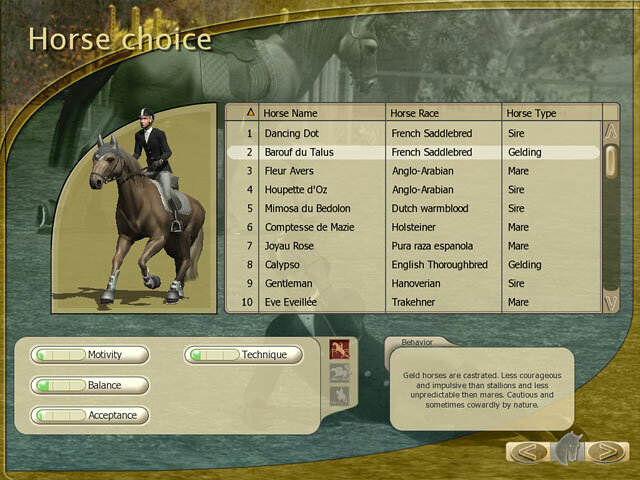 I absolutley adored the game, i love the dressage and jumping, simulations especially, when developing the game they could've made the graphics of horses and riders better. Rated 5 out of 5 by mom2aba from Best Horse Game Ever! I got this game for my 11 year old daughter who is really interested in horses. She absolutely loved it from the beginning. It's very realistic and lots of fun. It's not too easy, but not too hard. It doesn't have anything to do with caring for the horses, though, but it's still an amazing game. I think this game will hold hours of fun for her. Mount your horse and join world-class equestrians in jumping, 3-day eventing, and dressage competitions in this equestrian game.